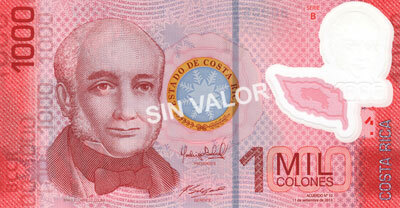 Marvin Alvarado, treasurer of the Central Bank of Costa Rica announced on June 12 at the High Security Printing – Latin America conference that took place this year in Punta Cana, Dominican Republic, the bank’s decision to change all their denominations currently printed on cotton paper to polymer substrate. Mr Alvarado pointed out that the bank’s decision was based on “the high counterfeiting rate of the current cotton paper banknotes, versus the null counterfeiting rate of the 1000 colones notes printed on Guardian™ polymer, which have been in circulation since 2011.” With many central bankers acknowledging that counterfeiting is a serious problem and the negative impact it has on the bank’s reputation, as well as the public’s confidence in their own currency, it was the next logical step for BCCR. The country’s relatively humid climate and the conservation of the environment are other factors why BCCR supports polymer substrate, as it is proven that polymer banknotes are more resistant to water and humidity, and are 100% recyclable!